The William and Mary style, also known as early Baroque in museum circles, dates from about 1695 through the mid-1720s. It is named for the king and queen, originally from Holland, who reigned together over England, Scotland, and Ireland from 1689-1694. This style is an American variation of the Baroque style popular in Europe earlier in the 1600s, according to American Furniture: Tables, Chairs, Sofas, and Beds by Marvin D. Schwartz. It is known to have Flemish, French, Chinese and, of course, Dutch influences. It was the first period furniture to move away from the boxy Jacobean styles that were popular previously. The dovetailing technique for joining furniture pieces together was gaining momentum during this period and afforded lighter construction and innovation in furniture making. William and Mary style pieces filled a demand for furniture providing both comfort and luxury at the end of the 17th century. According to The Metropolitan Museum of Art’s Web site, this style never achieved widespread popularity in the American colonies outside of major port cities. William and Mary characteristics and techniques often blended with Queen Anne styling later as furniture continued to evolve in colonial America. It is important to keep this factor in mind when identifying period furniture styles as design elements often overlap from one era to the next. Leg styles gracing William and Mary pieces were boldly turned, which means they were fashioned with chisels or other tools while being spun on a lathe. The elegance of the earlier Baroque period was recreated as seen in the Flemish scroll leg, spiral, trumpet and columnar leg shapes used on this type of furniture. Both scroll and Spanish feet were used to reflect elegance in William and Mary style pieces. Ball, bun, hoof, and turnip feet were also widely used. Painted and lacquered finishes (in the Chinese style) were common, with walnut and maple readily used. The dark look inherent in walnut, in fact, was popular at this time and is characteristic of the William and Mary look. Pine, cedar and some oak can be found in these pieces as well. Veneers, or thin sheets of wood, in varied colors and textures, were used to decorate the fronts of cabinets and desks. It is not uncommon to find that varied wood solids and veneers were used in combination to create one William and Mary style piece. Chair designs were thinner than previous styles with high backs and lavish embellishments. Side chairs were most common, but some armchairs were made as well. Chair seats were usually made of cane or rush, or upholstered in cushioned leather. Wing chairs, also known as easy chairs at this time, and daybeds that were chairs with extended seats, were also introduced during this era. Small tables designed for form and function were new to this era as well, such as tea tables and dressing tables. 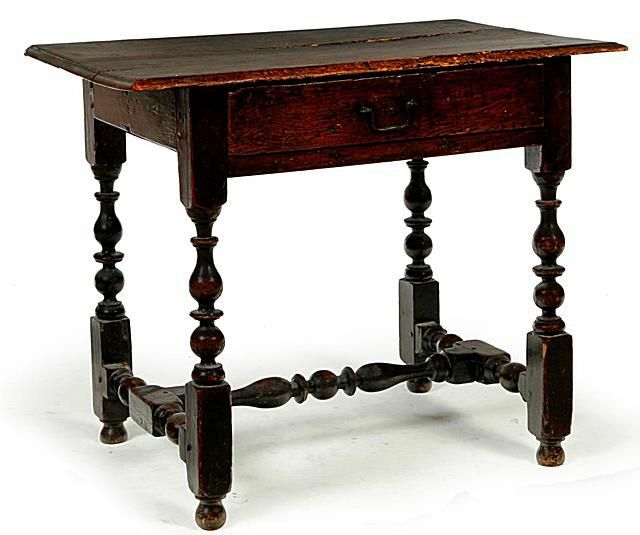 Gate-leg tables were the most popular and made in varied sizes for many different purposes. The butterfly table also came into favor during this era with the tavern table being one variation.